Running of the Bulb is a 4-player minigame in Mario Party. Its name is most likely derived from the traditional Spanish Running of the Bulls event. This is one of the only two Mario Party minigames requiring four-way cooperation, the other being Key-pa-Way. The minigame takes place in a fortress or castle, notably a hallway, where light sources hanging on the wall are lit. The player who holds the light bulb is positioned at the front, while the three other players stand beside the front player. The minigame then starts. The objective of the minigame consists of all four players working together to reach the end of the hallway, with one player holding the light bulb while the other three players act as bodyguards for them. The hallway is full of Boos, which attempt to engulf and hypnotize the players. Bigger Boo makes things difficult by slowly chasing all the players down the hallway, consuming those who fall behind. They can be eliminated by punching them when they get close enough, but if they get too close to the player, they will become possessed by the Boo(s). Players under the control of the Boos will usually attempt to retrieve the bulb from its current holder. Alternatively, if the possessed player has the light bulb, they will walk into Bigger Boo, forfeiting the game for the players. Either situation is easily remedied, however, as a punch from an ally will snap a hypnotized player back to reality. 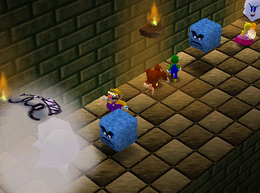 Players must also be aware of Thwomps, who appear as obstacles and attempt to fall on players, stunning them and opening them up to attack from a Boo. If the player with the bulb reaches the end of the hallway, all the players win, including those lost to the Boos, as the bulb illuminates the room and eradicates the infestation of the Boos. Failing to reach the end of the hallway or losing possession of the bulb, loses the game for the players, and they each must forfeit five Coins. The minigame can be purchased from the Mini-Game House for 400 Coins when it is available for purchase. Game Rules – "Run the bulb down to the socket. Punch the Boos before they grab you." Advice – "If somebody gets caught by a Boo, attack to free them." French Course allumée Can both mean "Lit race" and "Crazy race"
This page was last edited on September 20, 2018, at 12:37.